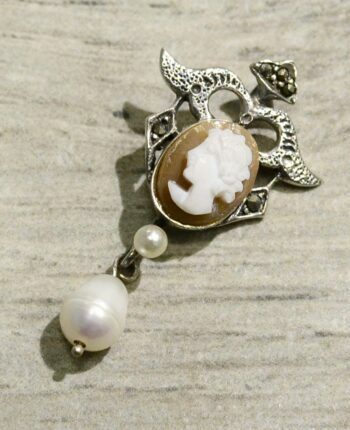 Our hand-carved shell cameo pendants have incredible details! This orange and white carved cornelian shell pendant features a profile of a woman with great details in her hair and face. 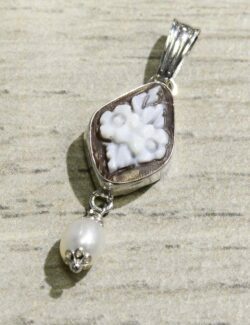 The pendant features a vintage-looking sterling silver design with five small marcasite stones set above and on either side of the cameo. The pendant’s design also uses two small white freshwater pearls. 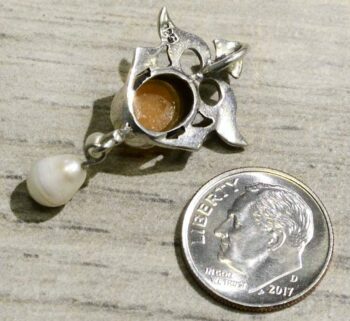 The smallest pearl is fixed directly below the cameo while the slightly larger sized pearl dangles below that. This cameo pendant was handmade in Italy and features the artist’s signature on the back of the cameo. 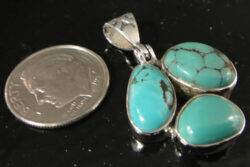 This pendant measures approximately 1.43″ long by approximately 0.75” wide. Please note that the dime is not included but is shown to help you gauge the size of the jewelry. This pendant has a medium sized bail (loop for chain) hidden on the back of the pendant which allows the pendant to fit easily onto most thin to medium styles of chains or cords (not included) or allows the pendant to work well as a unique focal bead for your own design. The back of the pendant is stamped with “925” so you can rest assured all metal used in the pendant is genuine .925 sterling silver. Our factory produces original cameos, entirely engraved by hand by the best artists in Torre del Greco on shells, and mother of pearls of special quality. All this is guaranteed by Mr. Gennaro Borriello’s signature on the back of the cameo. We also guarantee our production of original agate stone jewelry.